From the adorable little split to the herculean Nebuchadnezzar, wine is bottled in a dizzying assortment of differently sized vessels. Not only does each hold a different volume of wine, but they also have cool names derived from biblical kings and other historical figures. Large-format bottles tend to age more gracefully, as they have less oxygen exposure. Of course, these colossal trophy bottles also deliver grandeur and bring the “wow” factor to dinner parties. So whether you want a single pour of Prosecco or to host a party for 200 of your closest friends, there’s a bottle for every occasion. 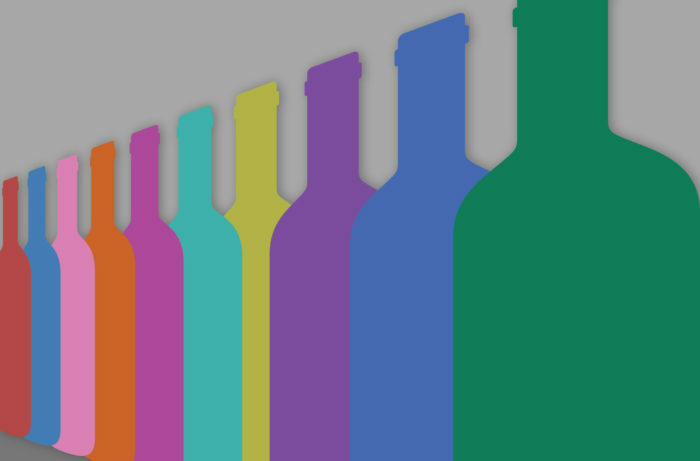 Check out our cheat sheet for wine bottle sizes, the stories behind their names, and how many glasses of wine are in each bottle. The ideal single-serve bottle, used almost exclusively for sparkling wines. Half of a standard 750-ml bottle, this size is a lovely option to share a healthy glass of something special with another person. While there’s no official name, falling between a half- and full-sized bottle, this format is primarily used for Tokaj, Sauternes and several other types of sweet wines. Old faithful. This standard bottle equates to approximately five 5-ounce glasses of wine. These deliver more bang for your buck and have grown in popularity in recent years, particularly with value European wines. A collector’s choice for cellaring ageworthy reds, magnums also excel at making a visual splash at parties. When one magnum just won’t do, the Jeroboam brings twice the volume. It’s named for the first biblical king of the northern kingdom of Israel . Another reference to a biblical king, Rehoboam was the son of Solomon and grandson of David (of David and Goliath fame). These bottles are used primarily by big Champagne houses for larger quantities of sparkling wine. The name of this format can refer to either an Imperial gallon or the oldest man in the Bible. Most just consider it a party in a bottle. Named after an Assyrian king, this oversized format houses a full case of wine in a single bottle. Balthazar, one of the Three Wise Men, would obviously have been smart enough to present a gift of 16 bottles of wine in one vessel. Named for the longest-ruling king of Babylon, the Nebuchadnezzar would also be the bottle of choice for Neo and Morpheus. Holding 24 standard bottles (or two cases) of wine and tipping the scales at almost 100 pounds, you might need some help carrying this down to the cellar. Named for the oldest of the biblical Magi. Named after the son of King David, rumor has it that Solomon would only enjoy his Cabernet out of this 26-bottle behemoth. A newer entry, Taittinger crafted this gigantic bottle in 1988 for the launch of what was then the world’s largest cruise liner, Sovereign of the Seas. Could a bottle that can hold three cases of wine be called anything else but Goliath, the giant defeated by young David? We can let these two historical kings, Melchizedek and Midas, battle it out for bragging rights on whose name is best suited for the largest wine bottle on earth.